In the summer heat, your kitchen can often become the mecca of horrid smells for your home. With this quick checklist you will be able to defeat the smells that reside in some of the gnurliest spots in your kitchen. Boiling water and a lot of ground citrus can sometimes help get rid of garbage disposal odor and leave your kitchen smelling like a lemon, Yum! However, you will get better results if you also use ODOREZE™ Natural Drain Smell Eliminator which will really do the trick. It will kill the smell and also help keep the blades clean to prevent future odor build up if you use it regularly. After every use of your oven or stove it is crucial that you wait for it to cool down and then sweep up any and all food particles that were left behind. Food smells after a while but old food that is being “re-burnt” every time you use your oven or stove smells even worse. 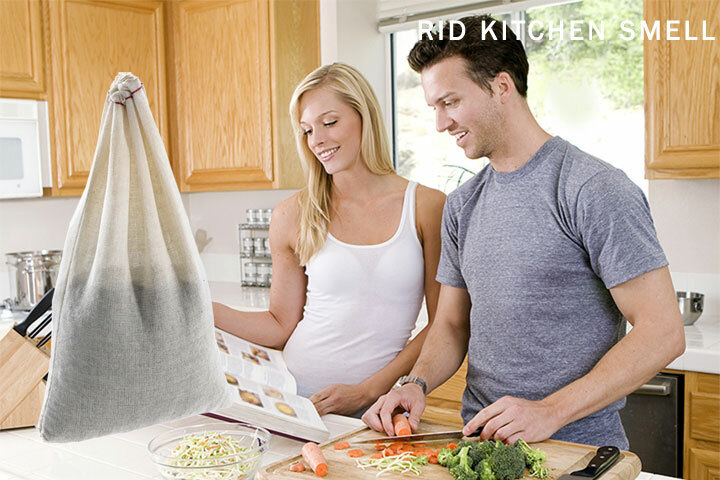 You can also use SMELLEZE™ Reusable Cooking Smell Removal Deodorizer Pouches in the kitchen to remove food odors. The simple solution to this problem is to make sure you do not leave a half full dishwasher for long periods of time. Running a light rinse whenever you see the dishwasher half full for too long will eliminate an odor. Consider getting in there with a nail brush if a smell persists. Old food? Spilt half and half? Take out? Nobody covets these smells. Placing a SMELLEZE™ Reusable Fridge Odor Removal Pouch is all you need. The moment you open the refrigerator or freezer door you will be able to tell the difference. And the pouch will last for years and lower your power bill as well! Probably this is the most common location of kitchen smells. Other than making sure to take out the garbage when it’s full…regulary sprinkling SMELLEZE™ Eco Garbage Smell Removal Deodorizer Granules is fantastic. I don’t think I can ever go back to just using garbage bags alone. Stay conscious of your household and the rest of your summer should be odor free. I am Patrick Merryman and I work at Total Mortgage and write for the Total Mortgage Blog. I also write for the Total Guide, one of the most comprehensive guides to all things home and education related.